The Medicine Hat Tigers started off their four games in five days road trip by paying a visit to Western Financial Place on Wednesday night to take on the Kootenay ICE. The Tigers defeated the ICE 6-3 and veteran forward Ryan Jevne picked up 4 points (2G, 2A) in the victory. The Orange and Black are 29-18-2-2 and they are led by Captain James Hamblin with 61 points (28G, 33A) and Ryan Jevne with 48 points (24G, 24A). After tonight’s contest, Medicine Hat will travel to Seattle Saturday and Portland Sunday before returning home to host Saskatoon on Wednesday. Tonight is the lone meeting this season between these two hockey clubs. 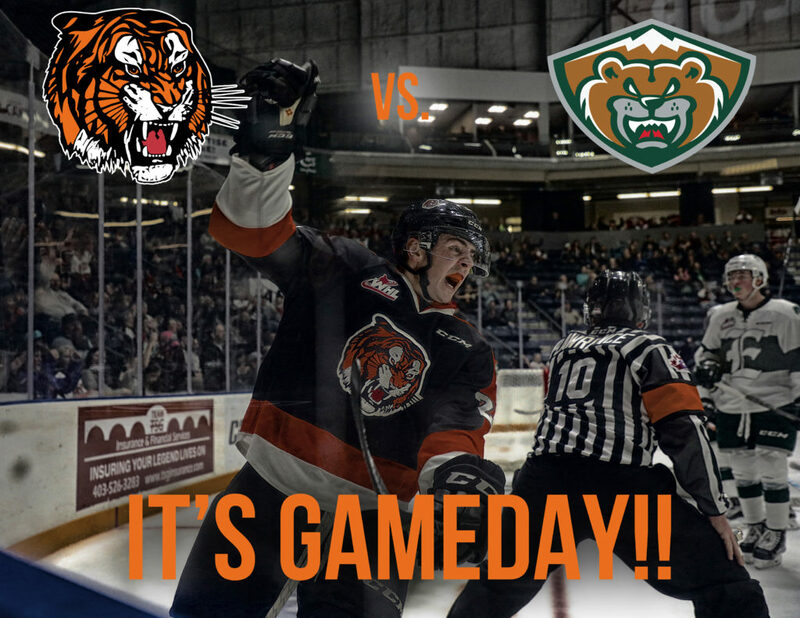 The last time these two clubs met, the Tigers defeated the Silvertips 5-4 October 11, 2017. Over the past five seasons, Medicine Hat is 2-1-0-0 against Everett. The Everett Silvertips defeated the Seattle Thunderbirds 7-2 Saturday night and improved their record to 37-12-1-1. 2018 Minnesota Wild draft pick Connor Dewar scored 4 goals and picked up 2 assists in his team’s victory. The Silvertips are led by Dewar with 70 points (35G, 35A) and veteran forward Bryce Kindopp with 56 points (29G, 27A). Ryan Jevne has been heating up for the Tigers and picked up 6 points (3G, 3A) in the last two games. The 20-year-old Edmonton product is a speedy forward who sees both sides of the puck well. He also has a lethal shot that makes opposing goaltenders cringe. Jevne has been having a banner year for the Tigers setting new career highs in goals (24) and points (48). Look for Jevne’s hard work ethic and hustle to make an impact at both ends of the ice tonight. Captain James Hamblin is the Tigers’ top point producer this season with 61 points (28G, 33A). The 19-year-old Edmonton native was selected by the Tigers in the first round of the 2014 Bantam draft. In his career as a Tiger, Hamblin has 74 goals and 102 assists in 245 games played. He is a speedy, intelligent, two-way player who works hard every game to help set the tone for the team. “The keys to this road trip are to have a lot of energy, continue to play as quick as possible, manage the puck and play as a team,” said Hamblin of this week’s four games in five days’ road trip. Søgaard is also ranked 4th in the WHL among goalies with 2.34 GAA and 0.930 save percentage. Tyler Preziuso is the only current Tiger who scored on the Silvertips in last year’s 5-4 contest. The Medicine Hat Tigers’ power play is ranked 5th in the league and 23.5% effective. James Hamblin leads the team with 9 power play goals while Linus Nassen and Ryan Jevne are tied as the top set up men with 16 power play assists each. Ryan Chyzowski had his 4th two-goal game of this season Wednesday night against the ICE. All four of Chyzowski’s two-goal games have been on the road. The Medicine Hat Tigers continue to score by committee with all 20 skaters lighting the lamp at least once to score the team’s 171 goals. James Hamblin leads the Tigers in plus-minus with +28. Daniel Baker is the Tigers’ top point producing rookie with 14 points (2G, 12A).